When it comes to shopping for the men in our lives, perhaps some of the most creative and unique Christmas gifts available are gift baskets for men. When we used to think of gift baskets, many of us would have nightmarish visions of plastic gift baskets that were skimpily filled with cheap items and marked with a high price tag. Thankfully these days, gift baskets are available that offer truly unique items, gourmet treats, and even collectibles. As if that isn’t tempting enough to sway you into investing in a gift basket this holiday season, many of them can be purchased for a very affordable price as well. What’s more, if you can’t find what you are looking for, you can even make your own gift baskets and offer custom made gifts that are sure to please. If you are considering purchasing a gift basket for the male recipients on your list this holiday season, you are in luck! We’ve included a list of our favorite ideas for gift baskets for men to help you choose the perfect ones for all of the men on your list this year. Cigar gift baskets are a unique way to show that aficionado in your life how much you care this holiday season. 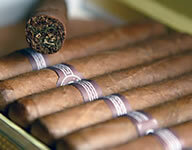 There are assorted styles and flavors to choose from, so you are certain to find a great match. Gourmet treats are plentiful in gift baskets these days, so whether your man likes chocolates, nuts, or other delectable goodies, you’re certain to find a gift basket filled with his favorite treats. Consider an “of the month” subscription for the man in your life this holiday season. You can choose from fruits, gourmet treats, wines or even beer selections and your special man will have the selection of the month delivered right to his home or office each and every month for as long as you like. choose from in this category as well. If your man likes coffee, you are in luck! Choose a gift basket that is filled to the brim with a variety of gourmet coffee samples and he is sure to be impressed. 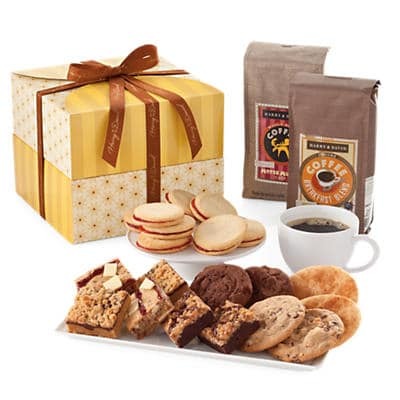 If you are having trouble deciding which gift basket to purchase for the man in your life, consider a sampler gift basket that offers a variety of snacks and beverages. When you are thinking of something even more unique, creating your own gift basket is a great idea. Purchase items that he can add to his collection, tools, gadgets, or just about anything his heart desires and fill a metal pail with your assortment to create a one of a kind gift he’s sure to love. Have you ever made your own gift baskets before? What types of item did you include in them? How did your recipients react? Do you plan to purchase ready made gift baskets in the future or make your own? Let us know- we love hearing from you!